National Manhood explores the relationship between gender, race, and nation by tracing developing ideals of citizenship in the United States from the Revolutionary War through the 1850s. Through an extensive reading of literary and historical documents, Dana D. Nelson analyzes the social and political articulation of a civic identity centered around the white male and points to a cultural moment in which the theoretical consolidation of white manhood worked to ground, and perhaps even found, the nation. Using political, scientific, medical, personal, and literary texts ranging from the Federalist papers to the ethnographic work associated with the Lewis and Clark expedition to the medical lectures of early gynecologists, Nelson explores the referential power of white manhood, how and under what conditions it came to stand for the nation, and how it came to be a fraternal articulation of a representative and civic identity in the United States. 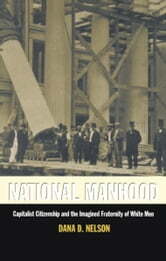 In examining early exemplary models of national manhood and by tracing its cultural generalization, National Manhood reveals not only how an impossible ideal has helped to form racist and sexist practices, but also how this ideal has simultaneously privileged and oppressed white men, who, in measuring themselves against it, are able to disavow their part in those oppressions. Historically broad and theoretically informed, National Manhood reaches across disciplines to engage those studying early national culture, race and gender issues, and American history, literature, and culture.